Legs burning? Acidosis? Horrible stuff that slows me down? Lactic acid and lactate typically get a bad rap from athletes, but what if I said that rather than slowing you down, lactate production enables high-intensity exercise? Well, it does. First, let’s discuss the compound itself. Lactate is not lactic acid. Lactate is a carboxylate, whereas lactic acid is a carboxylic acid. This means the carboxyl group of the lactate molecule is deprotonated and cannot contribute further to acidosis. The image below shows the difference between the two molecule types. The reason lactate does not exist as it's protonated acid form in the body is because the pKa of lactate is a low 3.9. This means is that in a solution with a pH higher than 3.9, the compound will exist as the deprotonated carboxylate, lactate. As shown below, in Table I from Cairns (2006), the lowest intramuscular pH values during exercise have been measured between 6.3 and 6.5 (also note the duration and type of exercises that produced these low pH values). Therefore, the majority of lactate/lactic acid found in the muscle and blood exists as the non-protonated version (lactate). Conversely, if intramuscular pH, or plasma pH were to drop under 3.9, lactate would accept a proton to become lactic acid – but as Table I shows, drops in pH of this magnitude do not occur during exercise. Lactate is not a source of protons so it does not contribute to acidosis. Then why we do see very high plasma lactate concentrations around the onset of acidosis? Glycolysis is a pathway for ATP production that can proceed in the absence of oxygen. It can provide ATP very quickly to contracting muscle cells. Often times you'll hear fast twitch fibers referred to as fast glycolytic (FG). They were given this name because faster twitching fibers rely heavily on glycolysis for ATP. While glycolysis provides our muscles with fast ATP, it also produces the substrate for lactate formation: hydrogen ions and pyruvate. Long story short, glycolysis takes a molecule of glucose and converts it to pyruvate through a series of reactions, releasing a net gain of 2 - 3 ATP per glucose molecule. In forming ATP, glycolysis also reduces 2 molecules of NAD to NADH + H. At low exercise intensities, the pyruvate created from gylcolysis is metabolized aerobically in the tricarboxylic acid (TCA) cycle, and the electrons are transferred to the electron transport chain to generate more ATP. In this case, lactate will not be created in significant amounts. But when exercise intensity is high, the H+ and NADH+H begin to accumulate in the muscle cells. This reduces redox potential, decreasing the ratio of NAD : NADH+H. The reduction in redox potential and accumulation of H+ ions slows glycolysis, inhibiting reactions that require NAD and reducing the number of ATP that can be created. Of course, without ATP, muscles cannot contract. It is very important that we keep NAD levels (redox potential) high in muscle cells because NAD gives us the ability to run the G3P dehydrogenase reaction in glycolysis to generate ATP and NADH+H. If this reaction is not able to run or is slowed because of inadequate NAD, the rate of ATP hydrolysis will exceed the rate of synthesis. And this will lead to accumulation of hydrogen ions which may have negative implications for contracting muscle. By converting the end product of glycolysis (pyruvate) to lactate, we are able to maintain NAD levels to a point. 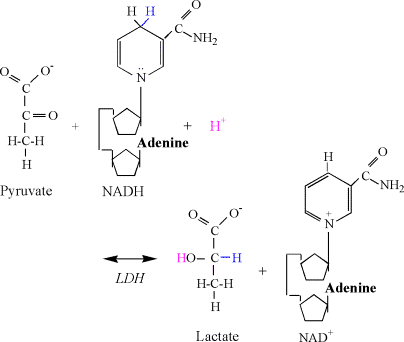 In this reaction catalyzed by lactate dehydrogenase (LDH), NADH + H is combined with pyruvate to create lactate and NAD. This regeneration of NAD enables glycolysis to continue running. Thus, to be able to continue to run glycolysis, an athlete needs to be able to create very high amounts of lactate to maintain redox potential. A professor of mine once asked us, “Are the best 400m runners the ones that have the lowest blood lactate levels after racing, or the highest?” The answer is the highest. Acidosis occurs when exercise intensity is very high, and H+ ions begin to accumulate because ATP hydrolysis outpaces synthesis. The body has multiple avenues to cope with H+, but when exercise intensity is very high these become overwhelmed with the amount of H+. When this occurs, intramuscular pH decreases and muscle contraction is compromised. 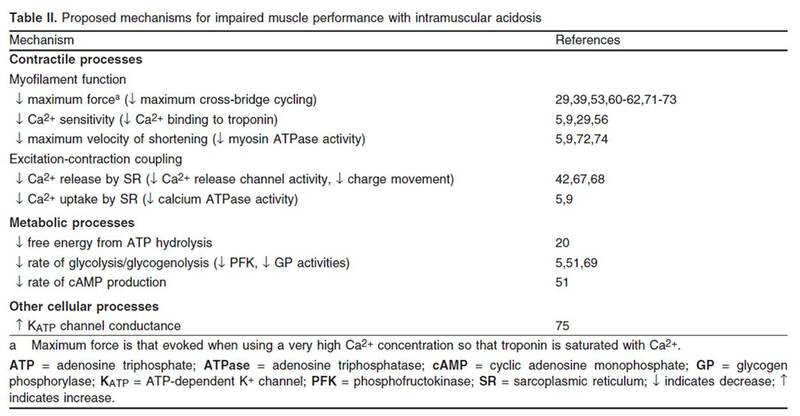 Table II from Cairns (2006) summarizes some of the possible mechanisms behind impaired muscle contraction during acidosis. Lactate production combats acidosis in two ways. First, the conversion of pyruvate to lactate consumes a proton (refer back to the image with the lactate dehydrogenase reaction). The other way lactate combats acidosis is by enhancing the shuttle of H+ out of the muscle cell. This is where it gets juicy. So, we know lactate is created in contracting skeletal muscle. Then how does it get to the bloodstream, and how do we accumulate lactate in the blood? Lactate is transported out of the cell through lactate-H+ cotransporters, also called monocarboxylate transporters (MCTs). These transport proteins can shuttle lactate out of the cell, but do so with a H+ too. For every lactate shuttled out, a H+ is also shuttled out of the cell and into the blood, increasing, or preserving intramuscular pH (Juel & Halestrap, 1999). Without lactate, these ions would remain in the cell and contribute to acidosis. Once in the bloodstream the H+ can be buffered by bicarbonate and exhaled (increasing ventilation) and lactate can be taken up by oxidative (slower) fibers (shuttled in by MCTs) or the liver and converted back into glucose via gluconeogenesis to be metabolized later again. I hope I have demonstrated, lactate is a good molecule. It does not hinder performance; rather it enables and enhances it. 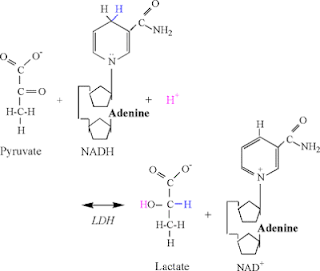 Lactate maintains redox potential by generating NAD, allowing glycolysis to continue. It accepts a proton that would otherwise contribute to acidosis, and it allows for transport of protons out of the muscle cells to maintain pH. Now that we have lactate on the brain, my next post will be more about training for lactate production and transport and training with lactate data. Cairns, S. P. (2006). Lactic Acid and Exercise Performance: Culprit or Friend? Sports Medicine, 36(4), 279-291. Juel, C., & Halestrap, A. P. (1999). 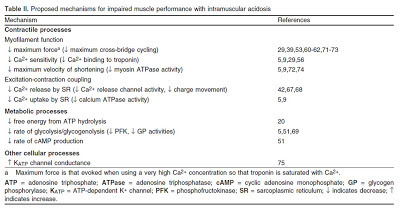 Lactate transport in skeletal muscle — role and regulation of the monocarboxylate transporter. The Journal of Physiology, 517(3), 633-642.